Here's my first experience with Austria's Crimson Cult, and their sophomore effort, Tales of Doom. For traditional melodic, heavy and power metal, it's been a good listen. The band, specifically with Gunter Maier (guitars) and Alexander Hilzensauer (bass), has existed in many forms, with Crimson Cult the latest inception. Crimson Cult: and the cult of big hair. Forget the album title,Tales of Doom, as this is not doom metal. Rather think Iron Maiden meets Savatage with, maybe, a spice of Blind Guardian. Basically, this is classic heavy and power metal, with the heaviness wrapped in serious and fluid melody. The Long Way Home may echo the aforementioned Iron Maiden. Warrior Son conjures the spirit of Dio, without copying it. While some songs, like the State of Fear, linger with something between the conventional and predictable, this album delivers the great and classic metal we remember, know, and love. Behind the Curtain, the short and rocking, Second Life, Behind the Curtain, and the aforementioned The Long Way Home are representative. For both the epic and heavy, Choshinja astounds. Even the anti-religious Institution Christ has merit. The album closes with an astounding instrumental, The Inquisition, which features, among the other members, the bass work of Alexander Hilzensauer. Conclusion: Crimson Cult's Tales of Doom is vital, satisfying, and entertaining classic melodic heavy metal. Very recommended. 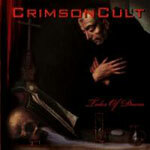 Crimson Cult's Tales of Doom is vital, satisfying, and entertaining classic melodic heavy metal. Very recommended.